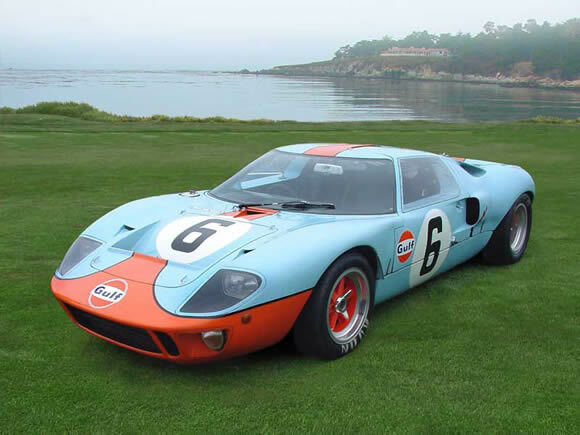 My favourite colour for the Ford GT40 is the Gulf colours run in 1968 and '69. The Gulf Oil Company sponsored the original GT40 design (Mk.1) using 302ci V8 and the new ZF transaxles. This set up was the winning combo and after several years of rule changes and fragility the GT40 started winning everything. The most outstanding would have to be the record breaking wins at Le Mans for both 1968 and 1969 using the same car (Chassis #1075). Jacky Ickx and Jackie Oliver teamed up for the 1969 race against the new Porsche 917's and new 3.0 litre cars from Ferrari, Matra and Alfa Romeo. What makes this victory special is that they were in an old car that no one gave a chance to and it was Ickx's first Le Mans. I have seen video of him walking to his car while everyone is running and staying there until he has done his seat belt up. He didn't like the 'Le Man's' start because no one belted themselves up properly. He was proven right when John Woolf fatally crashed his 917 on lap one and Willy Mairesse had a career ending crash because they weren't belted in properly. Maybe the run across to the cars was the part of the fascination with Le Mans but I'm glad they stopped it because the cars they were racing in were too powerful not to be securely belted in. Jacky Ickx has said he still considers the 1969 Le Mans race his greatest race of all and he would be right. An amazing win in a car that should have been outclassed. Beautiful car from a beautiful time. Read more here and here and for more beautiful motoring join us on Facebook. Has to be the quintessential GT. The way Ford stuck it to Ferrari at Le Mans was brilliant. A real flyer that still looks good today and performs well in historic races - especially in the UK where they seem to have several still running, and winning.